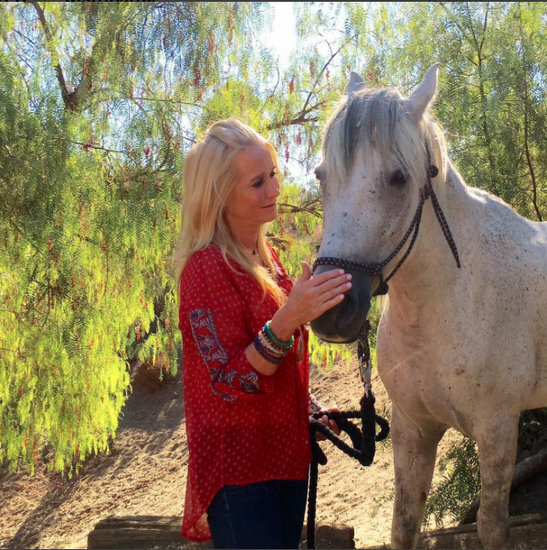 Kim Richards Is Rescuing Horses Now! Kim Richards is apparently trying to redeem her animal track record. Or who knows maybe she has to do some sort of restitution for all the people her former dog Kingsley attacked, but whatever the reason she’s now rescuing horses. The occasional Real Housewives Of Beverly Hills star shared a photo of herself with a rescued horse named Love who was “rescued just hours before slaughter” as part of the efforts of Sky Dog Sanctuary. “I have been blessed to be part @skydogsanctuary,” Kim gushed. Kyle Richards Sued – Kim Richards’ Dog Kingsley Allegedly Attacked Again! I hope Kyle Richards is having a relaxing vacation in Italy, because back home in Beverly Hills a storm awaits as Kim Richards and Kingsley strike again! Remember how Kim supposedly got rid of Kingsley, her attack pitt bull, after he mauled 5 people including Kyle’s daughter Alexia? Apparently Kim was actually hiding Kingsley in the closet all this time! According to a new lawsuit, before a Real Housewives Of Beverly Hills event in April, Kingsley attacked again! This time the maniacal dog struck an unsuspecting stylist. What was it Kyle said about the show being good for Kim? Kim Richards Has More Kingsley Drama – Sued Again By Family Friend He Attacked! Let’s hope Kim Richards was actually telling the truth about rehoming Kingsley because he has caused nothing but problems for the already troubled Kim. Kim is, once again, being taken to court by Kay Rozario, the former family friend who sued after being attacked by Kingsley in 2014. As a result of Kingsley’s out of control behavior, and Kim’s mismanagement of her aggressive dog, Kim was sued twice – once by a former trainer, and a second time by Kay, who alleged Kingsley attacked her while they were filming Real Housewives Of Beverly Hills at Kim’s house. Kingsley also bit Kyle Richards‘ daughter Alexia! Kim Richards Forced to Pay Dog Bite Victim! The day of reckoning has come for Kingsley’s first (reported) bite victim, 80-year old former family friend of Kim Richards, Kay Rozario. Rozario filed suit after she was bitten on her hand – reportedly down to the bone – by Kim’s pit bull while staying at her house back in March 2014. Although she was seeking restitution in the amount of roughly $1 million, Rozario was ultimately awarded only $8,083.53. This amount was $4 grand higher than the cost of her medical bills – $4,083.53 – which Kim refused to pay, thus sparking the initial lawsuit. The judge awarded a moderately higher amount because he said Rozario “deserved some more cash for emotional distress and trauma after the attack,” according to TMZ. True to form, Kim never responded to Rozario’s lawsuit, so the judge was forced to enter a default judgment. Kyle Richards Clears Up The Kingsley Story; Describes Her “Hurt And Anger” Over Kim Richards’ Comments About Her Daughter! Kyle Richards has had a traumatic season of Real Housewives Of Beverly Hills. From physical altercations, to major family dramas, to losing and gaining friendships. But hey, at least she finally got back into the good graces of viewers! KaChanelChing for popularity! With part 3 of the reunion featuring a dramatic showdown between Kyle and Kim Richards over Kingsley biting Kyle’s daughter Alexia, Kyle has some information to clear-up. She also comments on Brandi Glanville‘s ridiculous accusations and Lisa Rinna‘s text message drama. In her final blog, which Kyle admits she didn’t “want to write” (but she is contractually obligated to (and isn’t going to run-out and get smashed at a posh hotel then assault police officers instead of doing her job), she says things between herself and KimKillah have a long, long, LONG way to go before they’re resolved. If ever… but she is done taking the blame and keeping quiet! Kim Richards’ Dog Bite Victim Still Seeking Justice; Dog Trainer Says Kim’s Dog is Nuts! Oh, Kingsley. Why do you have the misfortune of being owned by the cuckoo Kim Richards? Alas, now you have bitten one too many people in your owner’s house of horrors and must be punished accordingly. Poor Kim Richards. the Real Housewives of Beverly Hills star is trying to get her life back on track, but she keeps straddling hurdles, especially when it comes to her beloved pit bull Kingsley. As you know, Kim gave Kingsley away after attacking a friend as well as her niece Alexia. Kim has been heartbroken over the chain of events, and now she’s facing a legal battle from Kay Rozario over the attack. This makes me sad on so many levels. It was clear how much Kim and Kingsley loved one another. I have a dog (thankfully one who isn’t easily provoked), and I have been attacked by a friend’s dog (thankfully nothing that a few stitches couldn’t mend), and it’s hard on all sides. I certainly felt for my friend who felt terribly for her dog’s behavior. That said, the dog had a long history of “being protective” to the point of attacking. Also, I hope that people don’t automatically look to the breed for blame. Anyone who has ever had a pit for a pet (I haven’t but would in a heartbeat) know they are, as a whole, some of the sweetest, most loving animals. Okay, I’ll stop Sarah McLaughlin-ing y’all and get down from my soap box. Let’s get an update on that lawsuit, shall we? Kim Richards Sued; Her Dog Kingsley Has Attacked 5 People Including A Family Friend! Kim Richards clearly does not keep her dog Kingsley on a tight leash! Last week he bit Kyle Richards‘ daughter Alexia, requiring two surgeries. But this is not the first time Kingsley has bitten – he attacked 4 (FOUR!) other people besides Alexia, including a close friend of Kim’s. And Kim is now being sued as a result! In a statement, Kim said Alexia went into a room where Kingsley was secluded, after being warned, and the dog attacked. Kay Rozario, Kim’s friend whom she refers to as a “second mother” was savagely bitten by Kingsley in March. While they were in Kim’s bedroom, Kay reached over the bed and Kingsley bit through her hand to the bone! He then went for her face, which Kay blocked with her raised arm, which was also injured! According to Kay the Real Housewives Of Beverly Hills star’s first reaction was, “Please don’t tell anyone. I’ll lose my show.” Cause, priorities! Then Rambles crouched over a trashcan and prayed that all of this would be thrown away in the garbage!